Nov. 30, 2018 – Mike Jenks has been in the logging business for a long time. He has worked through the strong years and weathered the lean seasons as they came. He kept ahead of the game by correctly reading the trends and coming up with innovative ways to succeed in what can be a difficult industry at the best of times. Mike Jenks Mike Jenks has been in the logging business for a long time. Jenks started out as a market logger in the 1980s working with Northwood Timber in Prince George, B.C., as a stump-to-dump contractor. He would bid on timber allotments at auction and would handle all aspects of the timber harvest from the forest to the mill. His association with Northwood eventually included an automatically renewing “evergreen” contract, which gave Jenks the financial stability he needed to help grow his company. When Northwood was sold in November 2001 to Canfor, Jenks sold his evergreen contract and his equipment and set out to retire on Vancouver Island. As it happens with many people who work hard their whole lives and enjoy the process, retirement didn’t really agree with Jenks. He began looking at what was going on around him on the island. He noticed that many of the larger players were utilising private land to supply their mills. Jenks saw that there was an opportunity to purchase acreages, which he would then log and sell the timber. Afterward, he could sell the land to buyers who were only too happy to acquire the already cleared property. In 2008, when the forest industry recession hit and logging went into a tailspin, Jenks stayed afloat by slowing down and doing smaller jobs until 2011 when the industry finally began to turn around. Jenks liked what he saw in the East Kootenays and noticed that the recession causalities included some desirable assets such as a wood treatment facility and a log peeling plant for making fence posts and other farm-ready products. He purchased those businesses and started Jemi Fiber Corporation, which he ran until he sold it to Canwel Industries in 2016. As part of the purchase agreement, Jenks agreed to stay on and manage things. He did so for about nine months before leaving to work on his own projects, one of which involved dealing with a new regulatory hurdle that had begun impacting the way he did business. In recent years the Ministry of Transportation has introduced new safety rules that govern how long a logging truck driver can operate on a continuous basis before requiring a nine-hour rest cycle. In an area like the East Kootenays, which has a lot of timber but limited milling facilities, this presented a real problem in getting the logs to the markets in the West Kootenays without incurring extra costs such as away-pay, hotels and extra meals for his drivers. Rather than operate at a loss, Jenks came up with a plan to build a reloading facility in the tiny hamlet of Yahk, B.C., near the dividing line of the East and West Kootenays. 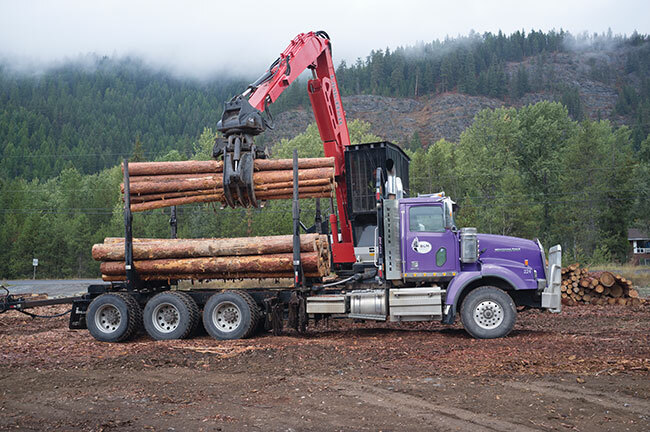 Jenks uses his fleet of logging trucks – seven Kenworth, six Western Star and one Freightliner with 22 trailers of various sizes and types – to move raw logs from his operations in Eastern B.C. to the reload yard where they are unloaded and rescaled. His drivers can accomplish this and return home well within the B.C. Transportation Ministry’s Commercial Vehicle Safety and Enforcement (CSVE)-imposed curfew of 13 hours. From there, independent contractors from the nearby area are loaded up and sent on their way to the customers in the west, which are close enough to the yard they can make their deliveries within the regulation time. The reload yard is a win for everybody involved. RGM Holdings can get its logs to market without incurring too much in the way of extra costs. The independent contractors who take the timber on the second leg of the journey gain valuable employment and sawmills such as Kalesnikoff Lumber, Interfor, Zellstoff Celgar and Vaagen Bros. Midway Mill in the West Kootenays can purchase the high-quality logs they need to continue their operations. 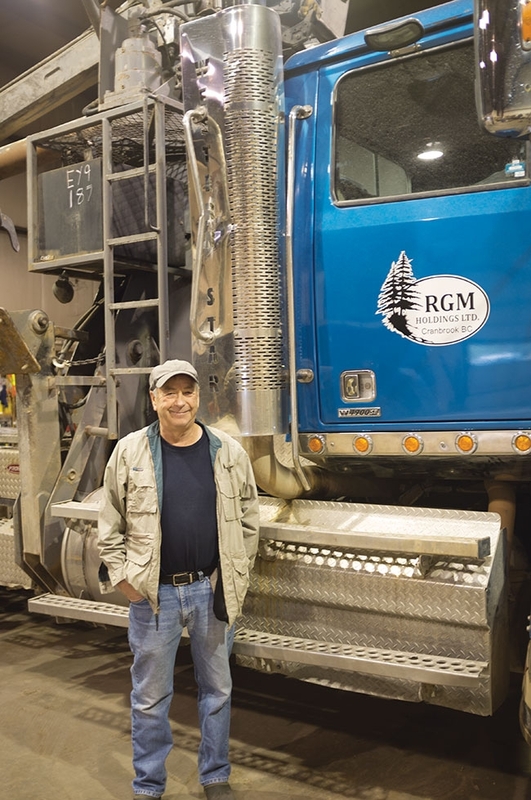 These days Jenks runs RGM Holdings and its subsidiaries from a spacious maintenance facility in Cranbrook, B.C. The company directly employs 40 workers and another 40 independent contractors. They also produce spinoff jobs for many others in related support industries throughout the Kootenays. About 20 per cent of RGM Holdings’ current business is in land development for recreation and residential purposes. His growing fleet of equipment includes a 2017 CAT 522B feller buncher and a 2018 John Deere 859M feller buncher. Two CAT 545GS grapple skidders get the logs to the landing while three CAT crawler tractors, a CAT 14G grader, a Hyundai EX200LC and a John Deere 270 move the dirt around. RGM runs three processors: a 2018 Link Belt 3240PHN, a 2015 CAT32002 and a 2018 John Deere 2154G, all with Southstar heads. They run a 2017 Link Belt 3740TLN loader and a Hyundai R220LC-9a crawler excavator with a Trend TR40 power grapple and a CWS grapple for attachments. Four Ford F350 trucks and a GMC ambulance complete the fleet. Whatever the future holds for the B.C. forest industry, you can be sure that Jenks will have a part in it. What others see as adversity and crushing bad fortune, Jenks sees as opportunity and a challenge. “In my time I have seen the industry change dramatically; you have to be ready to adapt and turn the disadvantages into advantages,” he says. RGM Holdings is a serious player in the British Columbia private-logging game and is well positioned to remain so for the foreseeable future.